From Keith Wynroe, what time is it? Puzzle time! You purchase a new clock but are dismayed to realize that both of its hands are identical. At first, it seems it’s going to be impossible to tell the time because you don’t know which hand is for the minutes and which is for the hours. However, you realize you don’t need to know which is which for every time — for example, when it’s 12:30, the minute hand will be exactly on the 6 and the hour hand will be halfway between the 12 and the 1. It can’t be the other way around because if the hour hand were exactly on 6, the minute hand would have to exactly on 12, which it’s not. So you know what time it is. How many times during the day will you not be able to tell the time? On Sunday, the Baylor Lady Bears won the 2019 NCAA women’s basketball championship, and on Monday, the Virginia Cavaliers did the same on the men’s side. But what about all of the unsung transitive champions? For example, earlier in the season, Florida State beat Virginia, thereby laying claim to a transitive championship for the Seminoles. And Boston College beat Florida State, claiming one for the Eagles. And IUPUI beat Boston College, and Ball State beat IUPUI, and so on and so on. Baylor, meanwhile, only lost once, to Stanford, who lost to five teams, and so on. How many transitive national champions were there this season in the women’s and men’s games? Or, maybe more descriptively, how many teams weren’t transitive national champions? You should include tournament losses in your calculations. All of this season’s women’s results are here and all of the men’s results are here. Congratulations to 👏 Joseph Kusko 👏 of Katy, Texas, winner of last week’s Riddler Express! Last week brought a mysterious sequence of letters, and you were meant to figure out what letter belonged in the blank space with the hint that you’d do well to think outside the box. In fact, you’d do well to think outside the alphabet entirely. The missing letter was Θ, the Greek capital letter theta. The letters in the sequence look like capital letters in the English alphabet, but they also look like capital letters in the Greek alphabet — iota, beta, tau, mu and so on. The trick to the sequence is that it hops through the Greek alphabet in such a way that there are no dead giveaways as to its Hellenic origins, such as Ω or Γ. Specifically, the sequence starts at I and goes backward seven letters with each step, wrapping around back to the end of the alphabet when necessary. Seven letters before O (that’s omicron), or after A (that’s alpha), is Θ (that’s theta). Congratulations to 👏 Charlie Koudsi 👏 of Los Angeles, winner of last week’s Riddler Classic! Last week, lucky you had won two gift cards to your favorite coffee shop, Riddler Caffei-Nation. The cards looked identical and each was initially loaded with 50 free drinks. You were interested more in the drinks and less in record keeping, so each time you redeemed a beverage you simply presented the cashier with one of the cards at random. One sad and fateful day, however, the cashier told you he couldn’t accept the card you presented him because it was out of drinks. What was the probability that the other card still had free drinks on it? How many free drinks could you expect were still available? Praise the Coffee Gods, there was a 92 percent chance that your other card was still valid, containing at least one drink credit. What’s more, you could expect that there were about seven drinks left on that card. So how do we get to those answers? Suppose, for the sake of generality, that each card started with \(n\) drinks. What we want to know are how many drinks, \(k\) (which could be anything from zero to \(n\)), remain on the other card when one card zeros out. Call the cards A and B. 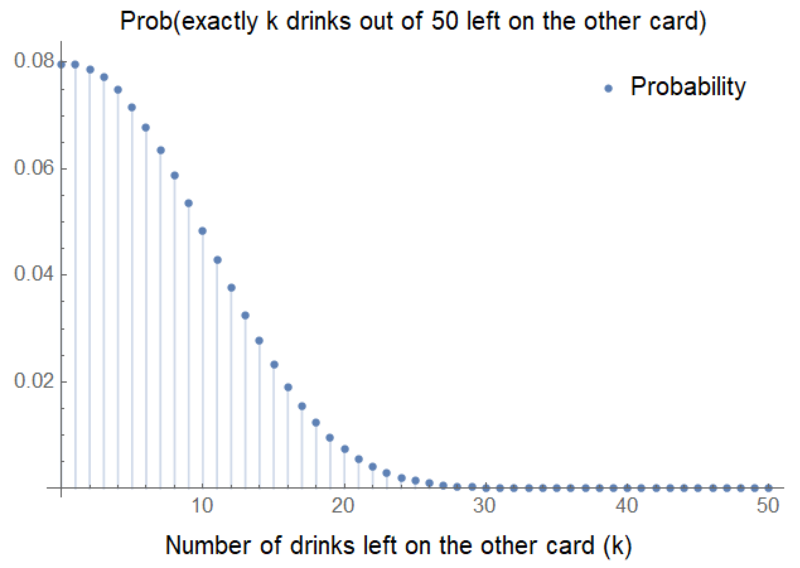 As solver Jason Ash explained, there are two possibilities: 1) Card A runs out of drinks first and Card B has \(k\) drinks remaining or 2) Card B runs out of drinks first and Card A has \(k\) drinks remaining. Since the cards are identical and we pick which to use randomly, these outcomes are equally likely, so we only need to analyze one of them, and then we can double the probabilities that result from that analysis. If we plug in 50 for \(n\) and zero for \(k\), we find the chance that both cards are actually exhausted — that chance is about 8 percent, so the chance that the other card does have at least a coffee left is about 92 percent — our first answer. Plug in \(n=50\) and that equals just over seven, our second answer. And we’re done.